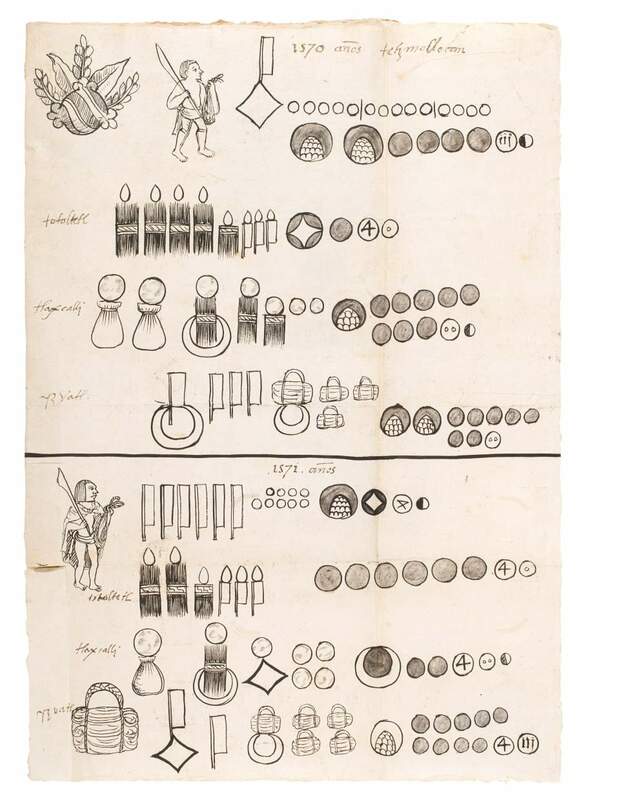 Illustrated manuscript in Spanish and Huejotzinca pictographs on paper by at least two hands. c. 317 x c. 221 mm. – 48 leaves, 6 drawings. This extremely rare manuscript is one of six known extant manuscripts from the Huejotzingo region of Central Mexico. The five other manuscripts are all in public institutions. Only three colonial era manuscripts (these from the 17th century) have come up at auction, at a Sotheby’s sale (Dec. 1995). Dated in 1571, the manuscript at hand is soundly attributable to the Huejotzingo region, based on its pictographic tradition (use of numerals, representation of people, place glyphs) and the signatures of indigenous authorities, which correspond to the same signatures on other documents. This manuscript adds a new contribution to the visual vocabulary of the region with pictorial representations not found in other codices from the same region. Adding further interest, there are two names included for local artists, perhaps pointing to the artists who drew this manuscript’s pictographs.